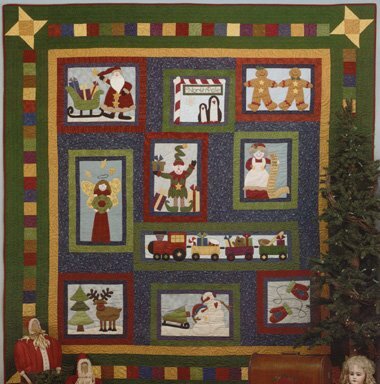 This is a 10 month "Block of the Month" machine appliqued quilt with pieced block cornerstones. Quilt size is 87" x 93" when finished. Individual blocks vary in size but all are suitable for individual wall hangings or pillows. Individual blocks are bordered but finishing instructions for individual blocks are not included. Complete instructions are given in each month's block. Applique patterns included are actual size. A color photo of the finished quilt appears on first month. All others show black and white drawings.